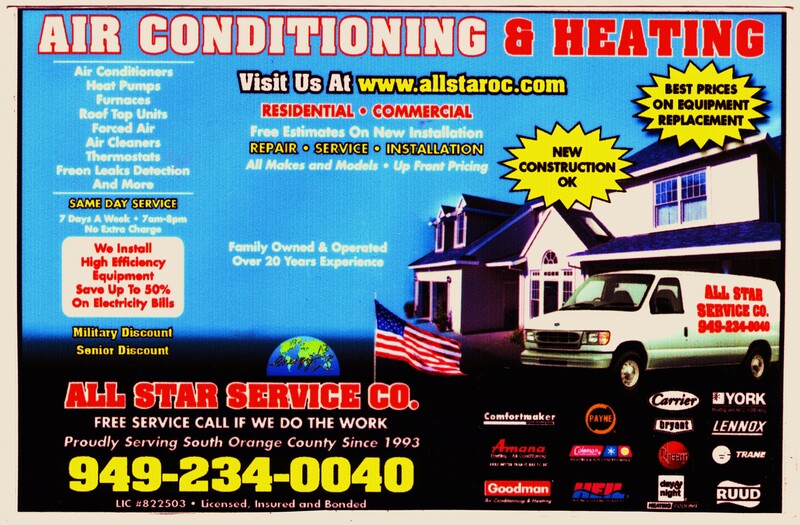 Our company repairs air conditioners and installs new air conditioners in Orange County Ca. Our service includes free estimates for new air conditioning installations. 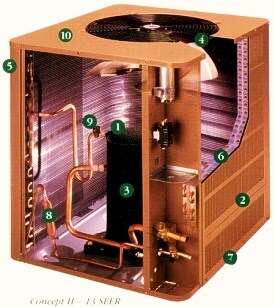 Prices for home ac replacement start at $1500* Free service call with new a/c unit installation. Freon recharges and freon leak detections at affordable price. Freon for air conditioning is being phased out. HVAC service cost increase. Air Conditioners containing R22 freon are no longer produced. Service repair and installation for following air conditioning brands:Carrier, Lennox, Bryant, Trane, American Standart, Amana, Rheem, York, Armstrong Air, Goodman, Payne, Tempstar, Ruud, Gaffers and Sattler, Central, Comfortmaker, GE and more. Professional air conditioning/furnace installationis available! Existing units using R-22 can continue to be serviced with R-22. There is no EPA requirement to change or convert R-22 units for use with a non-ozone-depleting substitute refrigerant. Such changes, called "retrofits," are allowed if the alternative has been found acceptable for that type of use. R-407C is allowed for retrofits but R-410A is not allowed in retrofits due to its higher working pressures. In addition, the new substitute refrigerants would not work well without making some changes to system components. As a result, service technicians who repair leaks to the system will most often continue to charge R-22 into the system as part of that repair. One important thing a homeowner can do for the environment, regardless of the refrigerant used, is to select a reputable dealer that employs service technicians who are EPA-certified to handle refrigerants. Technicians often call this certification "Section 608 certification," referring to the part of the Clean Air Act that requires minimizing releases of ozone-depleting chemicals from HVAC equipment. A Common Sense Approach To Servicing Your System | As noted above, chemical manufacturers will no longer be able to produce, and companies will no longer be able to import, R-22 for use in new A/C equipment after 2010, but they can continue production and import of R-22 until 2020 for use in servicing existing equipment. Given this schedule, which was established in 1993, the transition away from R-22 to the use of ozone-friendly refrigerants should be smooth. For the next 10 years or more, R-22 should continue to be available for all systems that require R-22 for servicing. As R-22 is gradually phased out, non-ozone-depleting alternative refrigerants are being introduced. Under the Clean Air Act, EPA reviews alternatives to ozone-depleting substances to evaluate their effects on human health and the environment. EPA has reviewed several alternatives to R-22 for household and light commercial air conditioning and has compiled a list of substitutes that EPA has determined are acceptable. One of these substitutes is R-410A, a blend of hydrofluorocarbons (HFCs) that does not contribute to depletion of the ozone layer, but, like R-22, contributes to global warming. R-410A is manufactured and sold under various trade names, including GENETRON AZ-20®, SUVA 410A®, Forane® 410A, and Puron®. An additional refrigerant on the list of acceptable substitutes for R-22 in residential air conditioners and other products is R-407C.